Bible Desktop is a free Bible Study tool that allows you to dig deeply into God's Word. Bible Desktop uses the JSword project to read modules in Sword format so there is a huge range of Bibles, Commentaries, Dictionaries, Daily Devotionals and some General Books - one of the largest collections available. Bible Desktop is open source software so it is freely available to anyone. It is licensed under the GPL. Bible Desktop is available from the download page. If you want to see what it looks like, the screenshots will help. A summary of recent news will help you keep in touch with development. Bible Desktop is based on the JSword Project, and reads modules created by the Sword Project. 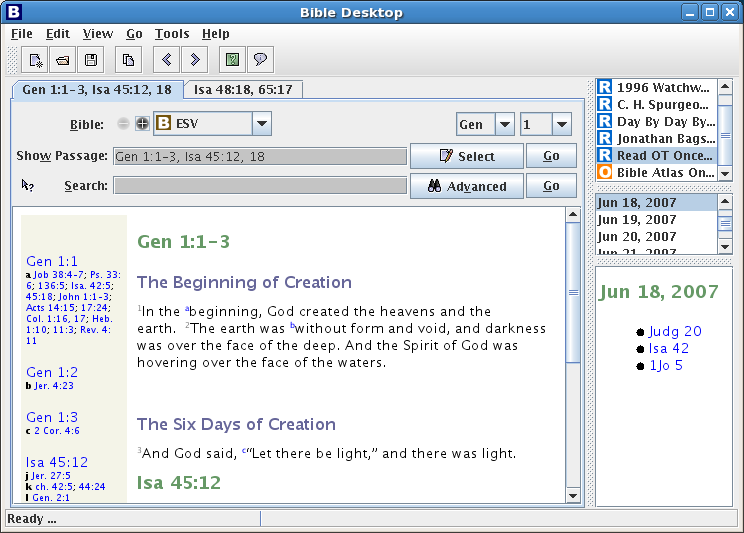 There is a page of screenshots that introduces the various features of Bible Desktop, including the tabbed interface, handy research area and advanced search features.